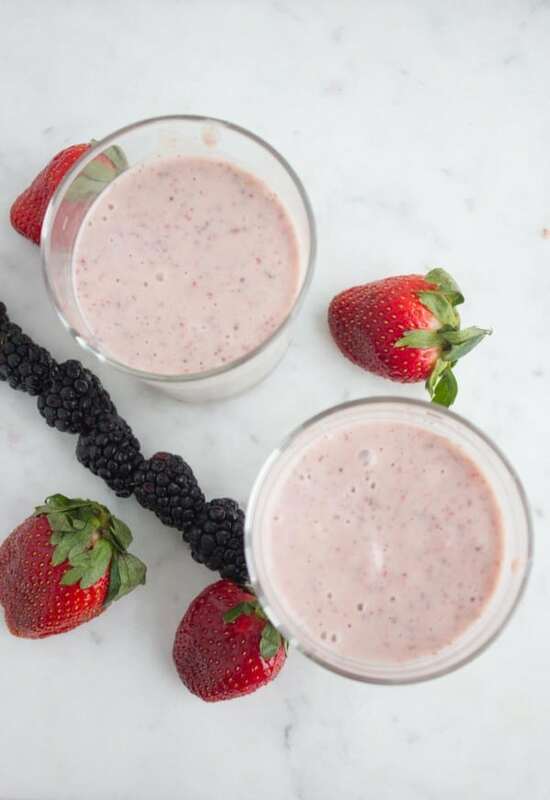 Grab the recipe for this Banana Berry Avocado Chia Smoothie for a quick, healthy breakfast that keeps you full for hours! 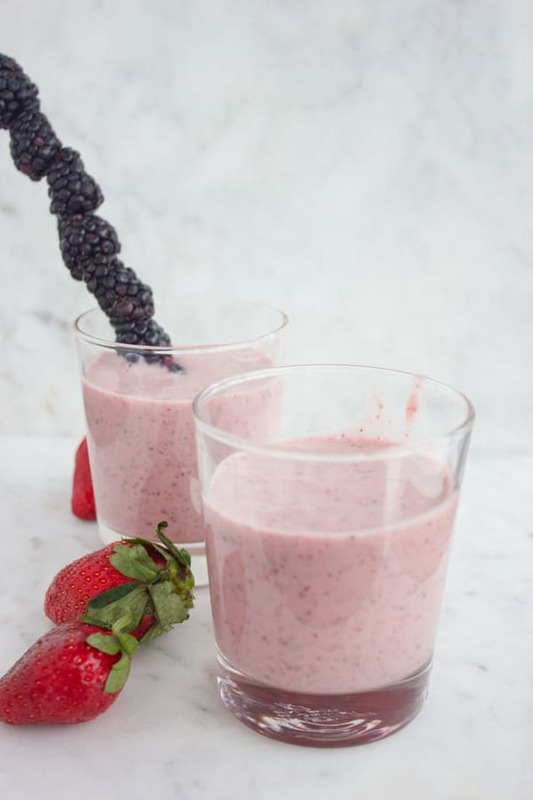 This easy smoothie is super fresh and light with absolutely no added sugar. Use nut milk for a vegan smoothie option. My Banana Berry Avocado Chia Smoothie recipe is so creamy and luscious, yet super fresh and light with absolutely no added sugar. If you’ve never had avocados in your smoothies, be prepared to be pleasantly surprised—not at the avocado taste because you won’t ever taste avocados, but at the creamiest silky smooth smoothie feel you’ll ever have! This Banana Berry Avocado Chia Smoothie my kind of smoothie—really creamy, thick, not too sweet or heavy and not too “milky” tasting—rather fruity. 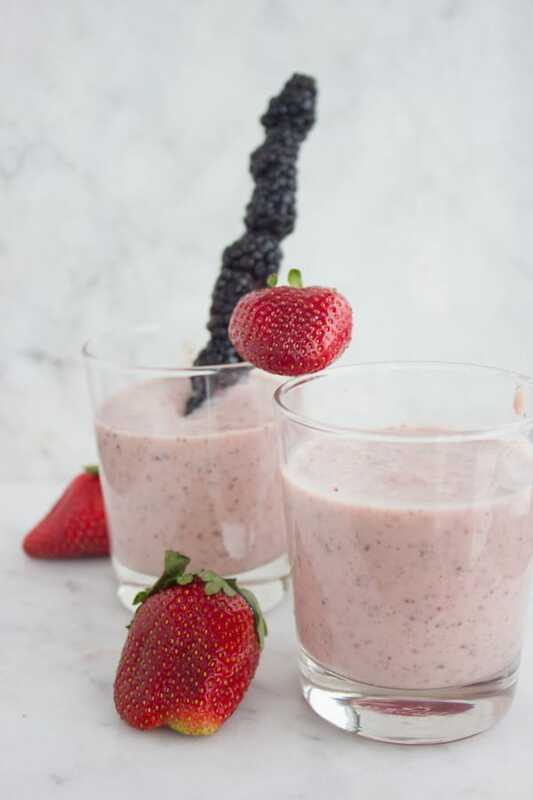 The sweetness in this Banana Berry Avocado Chia Smoothie comes mainly from the sweet berries and banana. Chia seeds, I mentioned it before in this divine instant chia chocolate pudding recipe, add plenty of thickness and texture to this healthy smoothie. If you add too many chia seeds, it turns into an instant pudding, so you want to err on the side of caution here. I add just a small amount of chia seeds for texture and also for its health benefits. Another thing that adds body to this Banana Berry Avocado Chia Smoothie is, of course, the banana. Although I am not a die-hard banana dessert person, I love it in my smoothies! The recipe for this easy, healthy Banana Berry Avocado Chia Smoothie could really not be any easier. 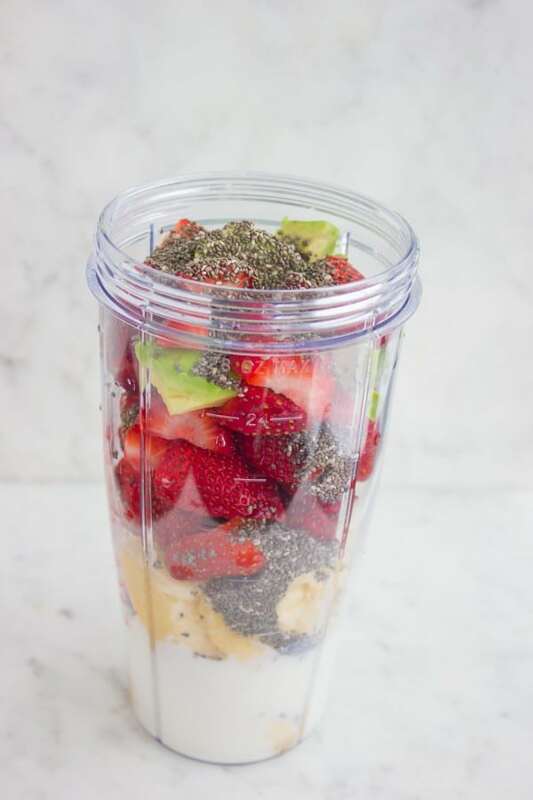 Simply take out a high-speed blender, and blitz all your smoothie ingredients together until smooth. Cheers! A word about avocados in smoothie recipes. If you’re a lover of avocados like me—then you have nothing to worry about. If you’re a lover of avocados but just a bit skeptical—you still have nothing to worry about. Should you be too skeptical, I assure you the taste of avocados is completely masked by the beautiful sweet ripe berries, banana, and milk. Avocados are actually quite neutral tasting, that’s why they are often used in sweets. They have a buttery smooth texture and a really neutral taste with lots and lots of omega-3 goodness! When it comes to this Banana Berry Avocado Chia smoothie, the avocado offers a silky smooth creamy texture. Plus it adds a neutral taste that balances out all the berry banana flavors. Swap orange juice for any citrus fruit. Make sure to adapt the sweetness accordingly. During cold months, when berries are not seasonal, I have experimented with less sweet berries. Also, I added some vanilla Greek yogurt to the smoothie for extra sweetness. It worked like a charm. I removed some of the milk and replaced half the amount with yogurt— so 1/2 cup of milk was removed, and 1/4 cup of yogurt went in. For a vegan smoothie, replace cow milk with your favorite nut milk. 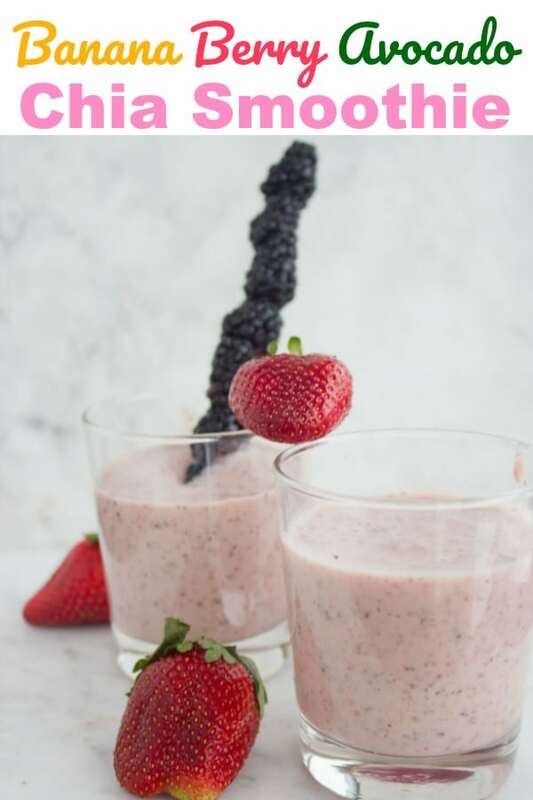 Grab the recipe for this Banana Berry Avocado Chia Smoothie for a quick, healthy breakfast that keeps you full for hours! 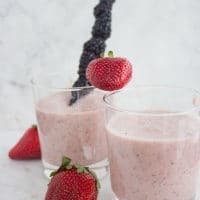 This easy smoothie is super fresh and light with absolutely no added sugar and you can use nut milk for a vegan smoothie option. Substitute orange juice with any citrus fruit. Make sure to adapt the sweetness accordingly. 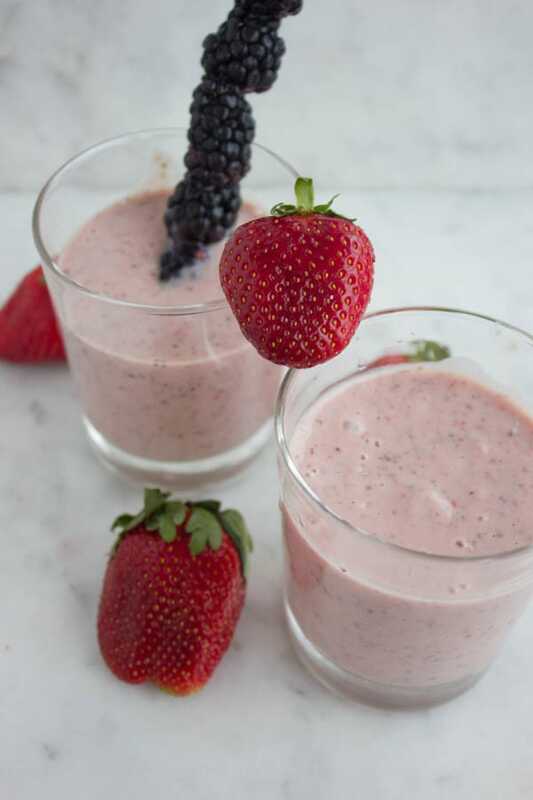 During cold months, when berries are not seasonal, I have experimented with less sweet berries and added some vanilla Greek yogurt to the smoothie for extra sweetness. It worked like a charm. I removed some of the milk and replaced half the amount with yogurt— so 1/2 cup of milk was removed, and 1/4 cup of yogurt went in.